NVIDIA today announced the new GeForce GTX 750 Ti and GTX 750 video cards, which are very interesting to use as they are the first cards based on NVIDIA’s new Maxwell graphics architecture. NVIDIA has been developing Maxwell for a number of years and have decided to launch entry-level discrete graphics cards with the new technology first in the $119 to $149 price range. NVIDIA heavily focused on performance per watt with Maxwell and it clearly shows as the GeForce GTX 750 Ti 2GB video card measures just 5.7-inches in length with a tiny heatsink and doesn’t require any internal power connectors! NVIDIA says that the Maxwell architecture used on the new GM107 (the GPU core used on the GeForce GTX 750 and 750 Ti) has allowed them to produce the most efficient GPU ever built. 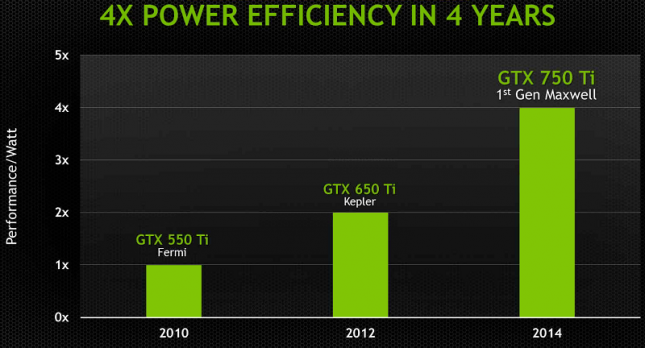 Kepler was revolutionary for performance per watt when it came out and so it Maxwell. Kepler was on manufactured on the 28nm process and was essentially an upgrade from the previous Fermi architecture that was done on the 40nm process node. NVIDIA has taken everything they’ve learned from their Tegra line of mobile processors and the Kepler desktop and enterprise processors and put all that expertise to good use in Maxwell. 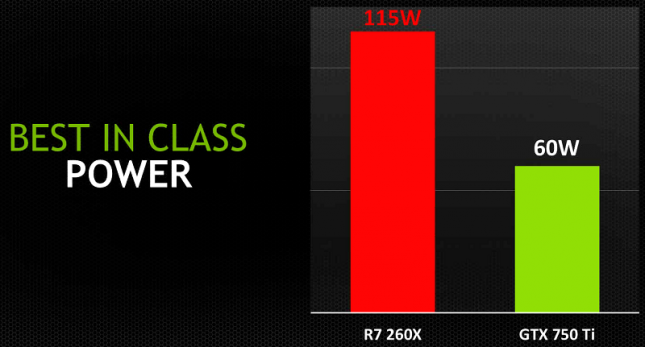 Maxwell has 135% more performance per core and twice the performance per watt. Added more control logic to the CUDA cores. Maxwell logic is better so they can control more cores controls fewer cores. The image above shows a very high-level block diagram that highlights the fact that NVIDIA greatly reduced the shader block sizes into smaller clusters with added control logic. This allows them to to better control the CUDA cores on each particular Maxwell GPU and really helps improve the efficiency. 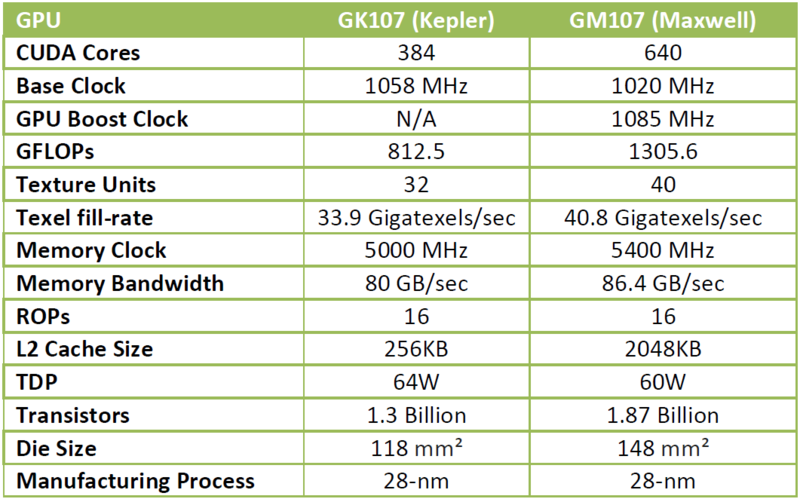 Here is a nice table that shows a high-level comparison of the GM107 Maxwell GPU versus the previous generation Gk107 Kepler GPU. The GM107 ‘Maxwell’ GPU has 640 CUDA cores with 1.87 Billion transistors and a die size of 148mm2. 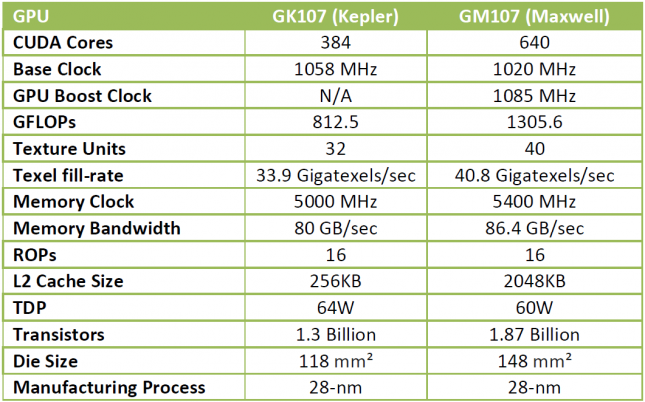 The NVIDIA GK107 ‘Kepler’ GPU had just 384 CUDA cores with 1.3 billion transistors and a die size of 118mm2. The really cool thing is that NVIDIA’s GM107 has higher performance specs and has a slightly lower TDP even though it has 570 million more transistors at the same 28nm manufacturing process! NVIDIA says that gamers generally upgrade their video card on every four years on average and that the new GeForce GTX 750 Ti will give those people a huge boost in power efficiency. NVIDIA believes that the GeForce GTX 750 Ti will be about a 2x performance upgrade at a fraction of the power use for those still using a GeForce GTX 550 Ti video card from 2010. NVIDIA has taken notice of the boom in Mini-ITX gaming PCs and think that the GeForce GTX 750 Ti is a perfect match for someone looking to build a 1080P small form factor (SFF) gaming PC as you need just a 300W power supply and there is no 6-pin power connector needed on the GeForce GTX 750 Ti reference card. Some manufactures will be putting a 6-pin PCie video card power connector on the boards, but from what we can tell it should be needed even when overclocking. Why is that? NVIDIA has placed overclocking restrictions on the GeForce GTX 750 Ti and right now the BIOS only allows the CUDA cores to be overclocked by 135MHz. The memory isn’t locked down, so the sky is the limit there. NVIDIA originally planned for the GeForce GTX 750 Ti to be in direct competition with the AMD Radeon R7 260X, but it appears that last weeks launch of the AMD Radeon R7 265 2GB video card at $149 spoiled that. The NVIDIA GeForce GTX 750 Ti looks like it should perform as fast or faster than the AMD Radeon R7 260X across the board and it should do it cooler and quieter. NVIDIA says that the the first graphics cards to use the first-generation Maxwell architecture were designed to do more with less, so keep that in mind when looking at the specifications here. 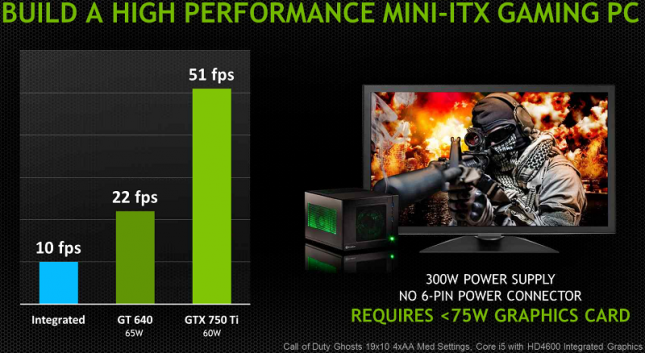 The NVIDIA GeForce GTX 750 Ti has 640 CUDA Cores that have a base clock of 1020MHz and a boost clock of 1085MHz. The GTX750 Ti supports NVIDIA Boost 2.0 technology, which means that it the parameters are okay that they card can clock higher than this. 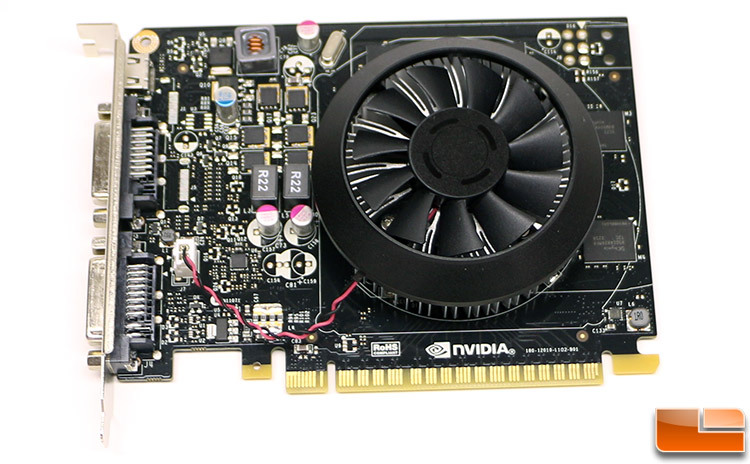 The GeForce GTX 750 Ti uses a 128-bit GDDR5 memory bus and you have the option of purchasing a 1GB or 2GB model. The memory is clocked at 1350MHz (5400MHz effective) and that gives you about 86.4 GB/s of memory bandwidth. The NVIDIA GeForce GTX 750 Ti should be used with a 300W or greater power supply as it has a TDP rating of just 60 Watts. The GeForce GTX 750 Ti supports DVI, VGA (D-Sub), HDMI and DisplayPort video outputs, so you’ll see a variety of options in the retail market. The one thing we need to point out is that you might want to go out of your way to find a model with DisplayPort 1.2 if you pan on purchasing an NVIDIA G-Sync monitor as it is required for G-Sync to work. You’ll need to look for an Add-In-Board (AIB) Partner that has DisplayPort 1.2 on their card. It would have been nice if NVIDIA didn’t make Displayport 1.2 optional on these entry level gaming graphics cards, but it is too late now. 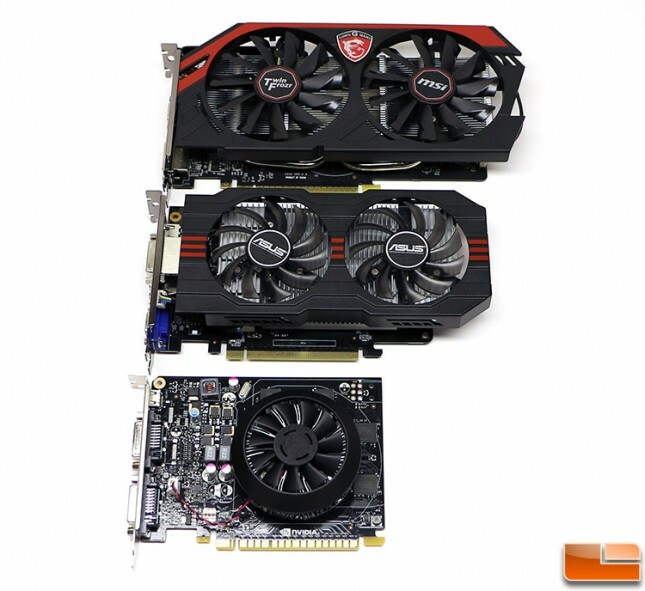 The GeForce GTX 750 Ti also does not support HDMI 2.0. The NVIDIA GeForce GTX 750 is basically the same thing as the as the except it has fewer CUDA cores, just 1GB of GDDR5 memory and a 5W lower TDP. 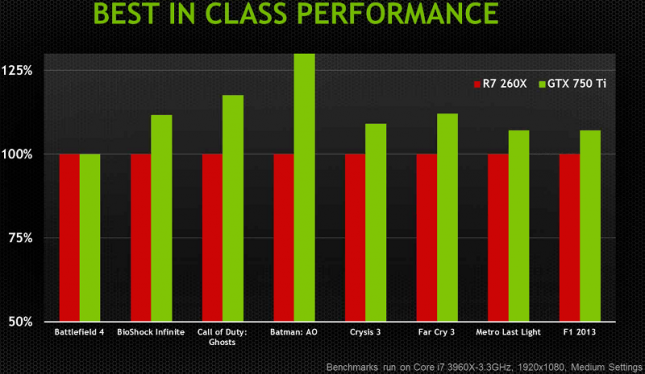 NVIDIA reduced the number of CUDA cores from 640 to 512, which is a 20% reduction. The number of texture units drops from 40 to 32 and the number of ROPs remains the same at 16. NVIDIA is exploring the idea of releasing a 2GB version of the NVIDIA GeForce GTX 750, but right now there will just be a 1GB variant. The NVIDIA GeForce GTX 750 will cost $119.99 at launch and will be competing in the marketplace against the AMD Radeon R7 260X 1GB that also shares an MSRP of $119.99. 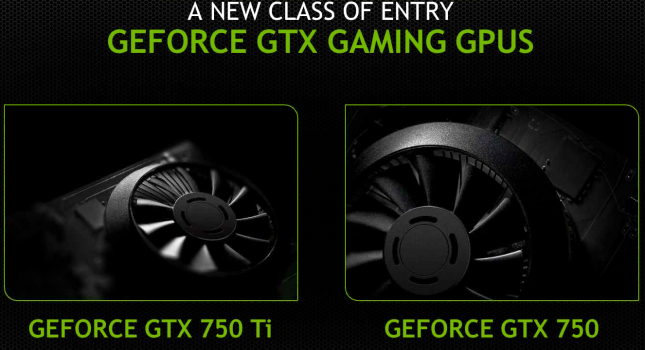 The NVIDIA GeForce GTX 750 and 750 Ti will replace the GeForce GTX 650 Ti series in the GeForce line-up. 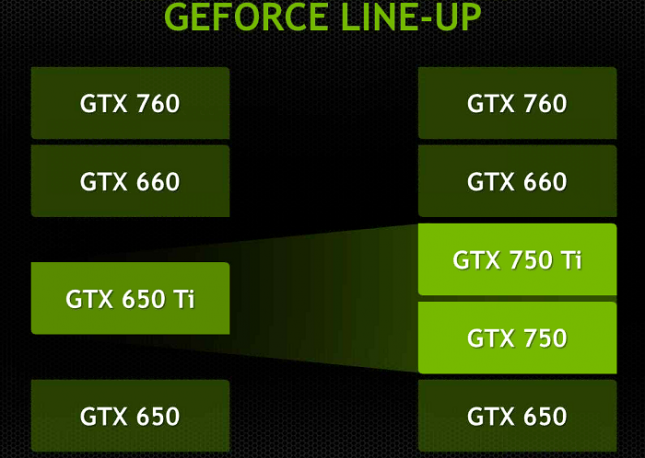 This means that they will be above the GeForce GTX 650 and below the GeForce GTX 660 in terms of price and performance. Today Legit Reviews will be looking at the NVIDIA GeForce GTX 750 Ti 2GB reference card along with custom cards by ASUS and MSI.